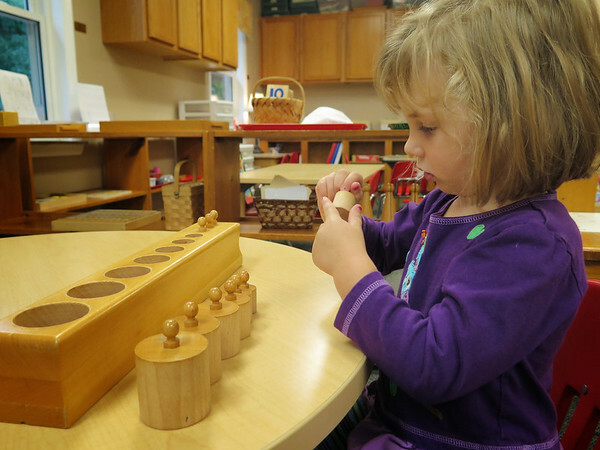 A child explores the knobbed cylinders. "A room in which all the children move about usefully, intelligently, and voluntarily, without commiting any rough or rude act, would seem to be a classroom very well disciplined indeed." - The Montessori Method. 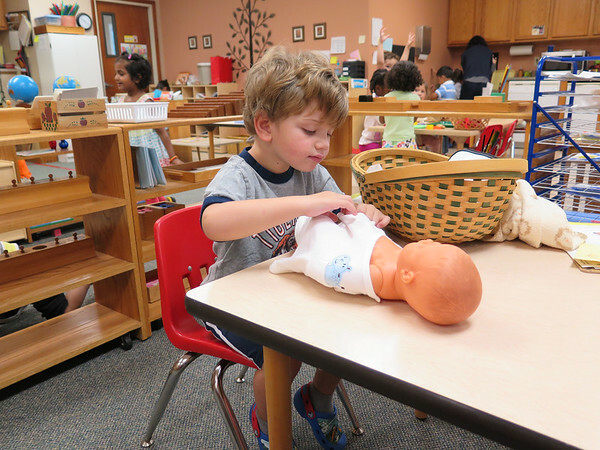 At the beginning of the year, Montessori Toddler and Preprimary classrooms are far from normalized. Some children shout, wander the room, and maybe even throw objects or dump materials on the floor. There is crying and spilling. Messes are made and not cleaned up. Disagreements arise. Those first few weeks can be wild, indeed! In traditional educational methods, teachers might respond to these behaviors with reprimands and punishments. 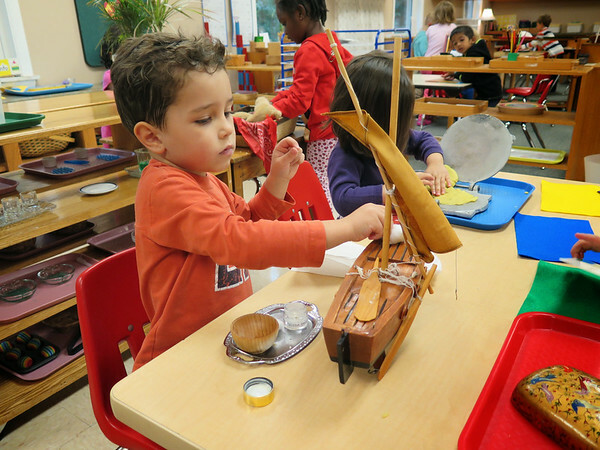 In Montessori classrooms, the teachers respond with redirection to purposeful work. For example, when a new three-year-old is wandering the room and disturbing the work of others, a teacher will take him by the hand and present a new material to him. If he has shown an interest in counting then we might present the Hanging Bead Stair. When this work is completed, we assist him in finding another activity that calls to him. While polishing the sailboat, a child tunes out everythiing else around him. Whatever the activity the child is redirected to, the aim is always the same: to develop concentration. Concentration is the key to a child's natural development and all learning takes place in a state of concentration. We can think of ourselves in our adult lives to get a better understanding. When you need to study for your GRE exam, what do you do? Do you head to a busy shopping mall to work on your laptop in the food court with your friends, or do you choose a quiet place? If you need to paint a room in your home, do you do it in the afternoon when the children are busy around your feet or do you save it for those glorious, quiet mornings when they are at school? Adults relish those moments when they can concentrate and really focus on their work without interruption. Children also relish those moments, but they must first know what concentration feels like. This is what a Montessori classroom does: it provides an environment where children are free to concentrate - without interruption - on work that is essential to their development. A child who is excited and distracted by all the activity around him will transform into a peaceful, thoughtful individual when he is able to concentrate on a work he enjoys. Because concentrating and being in control of his body feels better than thrashing around wildly and causing mayhem, he continues to seek out other activities that allow him to feel this way. Since concentration is the ultimate goal of every activity in our classroom, we are reverent of it when it appears and we do not interrupt it for any reason. If all learning occurs during a state of concentration, it would be illogical to interrupt a child's concentration in an attempt to "teach" her something. Corrections, points of interest, fixing a lock of hair that has fallen over her eye, picking up the pencil that rolled off the table, reminding her to wash her forgotten snack plate - we must do none of these things. In fact, when a child begins to concentrate on an activity, our job is to quietly step away and behave as though we are not in the room. Dressing the baby doll and fastening its clothes requires great concentration. Some children choose this activity nearly every day. Eventually, in a few weeks or even months, the classroom has been transformed from a noisy, chaotic scene into a peaceful, happy place to learn and play. We have seen this transformation begin in our classrooms. The children are beginning to put their belongings in their lockers and walk quietly into their classrooms. They greet their friends warmly, but not loudly. They choose work, complete the work, and put it away when they are finished. They choose to work with a friend or by themselves. They tap us on the shoulder when they have a question. They pour their own water for snack and wash their dishes when finished. They use the toilet without assistance (although assistance is always available.) They are also preparing to read, write, and count to 1000 - but when you are a young child, those accomplishments are of secondary importance compared to the ability to control one's body and interact peacefully with friends. Your children always benefit from opportunities to concentrate on an activity. You can provide these opportunities at home by providing space and, most importantly, time for them to focus on just one thing. Maybe painting with watercolors, washing the breakfast dishes, watering the plants outside, looking at the spider web by the front door - let her look and explore for as long as she wishes. Be available to answer questions, but don't obey your urge to jump in and explain everything you've ever heard about spiders or tell her all about color theory. Let her concentrate and formulate her own ideas and questions. When her curiosity is satisfied and she is ready to turn her attention elsewhere, you may notice that she looks refreshed and relaxed. This is a sign that she is learning and making new connections in her brain! Dr. Montessori observed that, "The child who concentrates is immensely happy." Do you have a story about concentration from your life or your child's life you would like to share in the comments below? We would love to hear about it. May you find yourself concentrating and immensely happy in the week ahead. Thanks for reading.